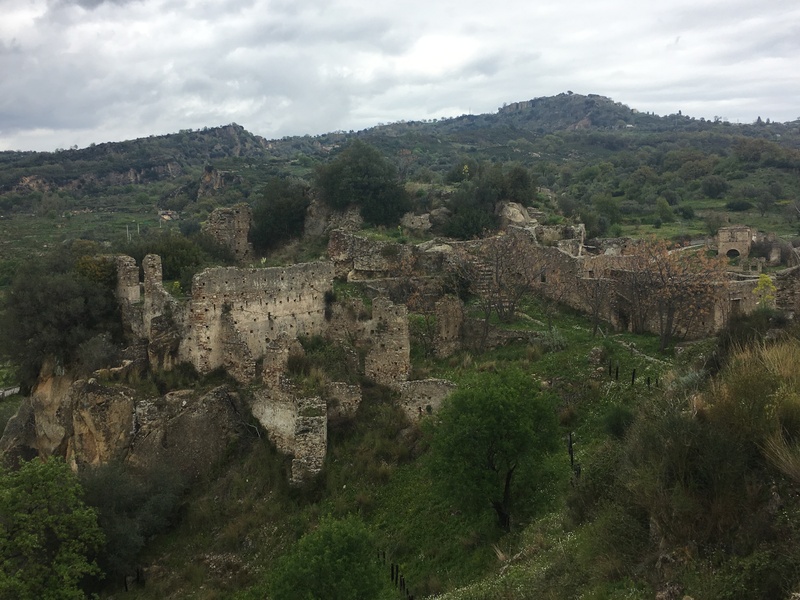 We had ended up here – near the village of Canalello and Ferruzzano station – unexpectedly so we had no plans and knew nothing about the area. It seems a little ungrateful to just move on when an area has made motorhome parking available and besides we still hadn’t managed to blow the cobwebs from our hair after our lethargic campsite days. What to do? A little research was called for so we explored on google maps and wikiloc to see what was recommended in the area. Google maps came up trumps with an interesting looking abandoned village inland. Abandoned villages are not unusual in Italy, we’ve already visited a few, but each has it’s own character and history. The abandoned village gave us a destination to build a bike ride around and wikiloc gave us a few options for routes, and although none would take us quite where we wanted to be we could knit together bits of the off road routes with roads on google maps and end up with a good day out. After we’d found a local bakery for our lunches we set off inland, an initial very steep climb (i.e. I had to get off and push) up via Puglia took us onto a rough track over farmland before we hit a crossroads where we went straight onto the SP170. It looked like a main road, but there were signs forbidding any large vehicles, we could see why when we found part of the road collapsed. 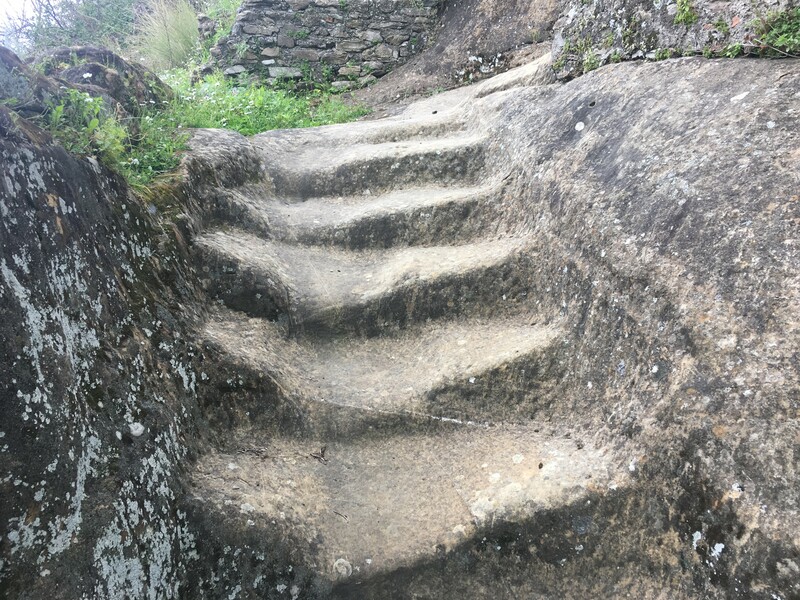 There didn’t seem to be any rock supporting it, just dirt that had been washed away. 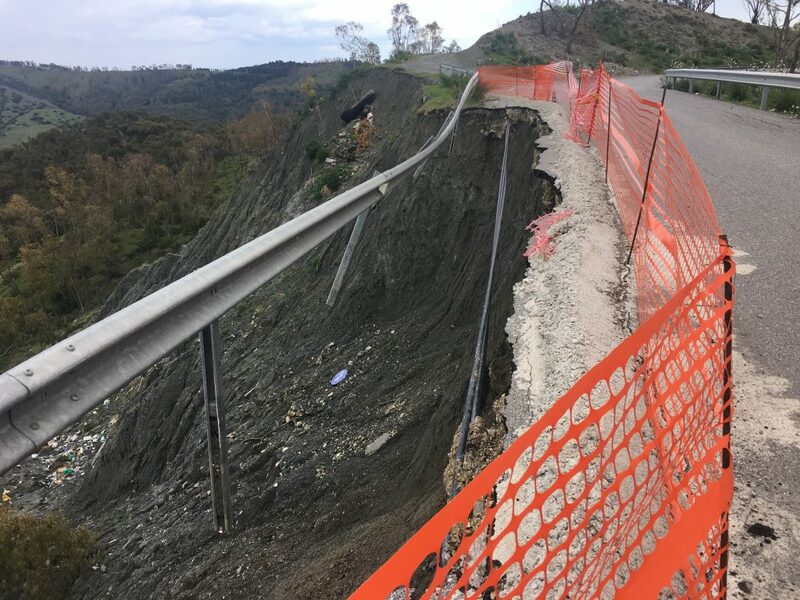 Apparently landslides are very common in the Aspromonte mountains, and although we were only in the very beginning of the foothills it was no different here. Where did the road go? If you look carefully you can see a round blue cycle route sign. It is quite common for Italian railway stations to be named for a town inland, miles from the railway line. So Ferruzzano station is by the sea, but Ferruzzano was 10k inland. We had a number of false starts as we tried to make our way up the smaller roads to Ferruzzano. Some ended in fences proclaiming private property and one had been completely washed away, leaving only a stream and some exposed pipes and cables, so in the end we followed direction from google maps. From Ferruzzano we followed the road to Bruzzano Vecchio. 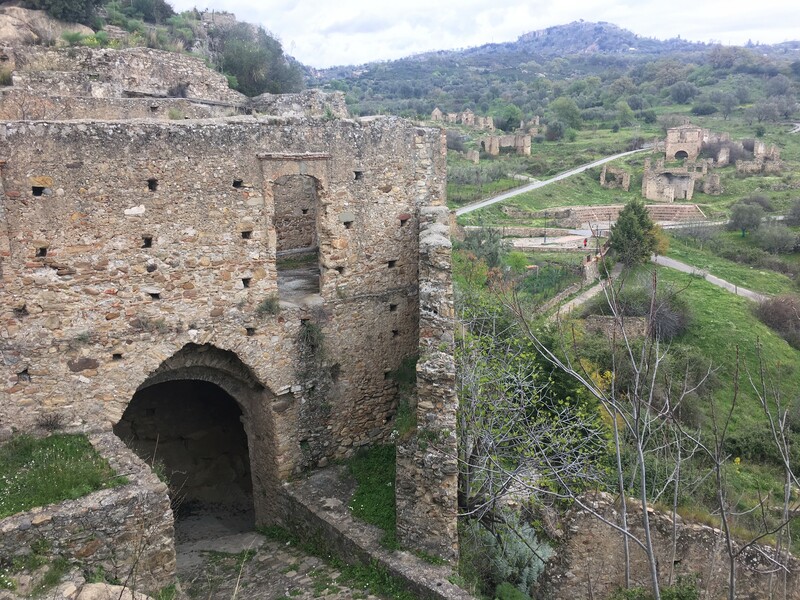 The mediaeval village was finally abandoned due to an earthquake in 1906 (or possibly 1905 or 1908 – each article I’ve read gives a different date). 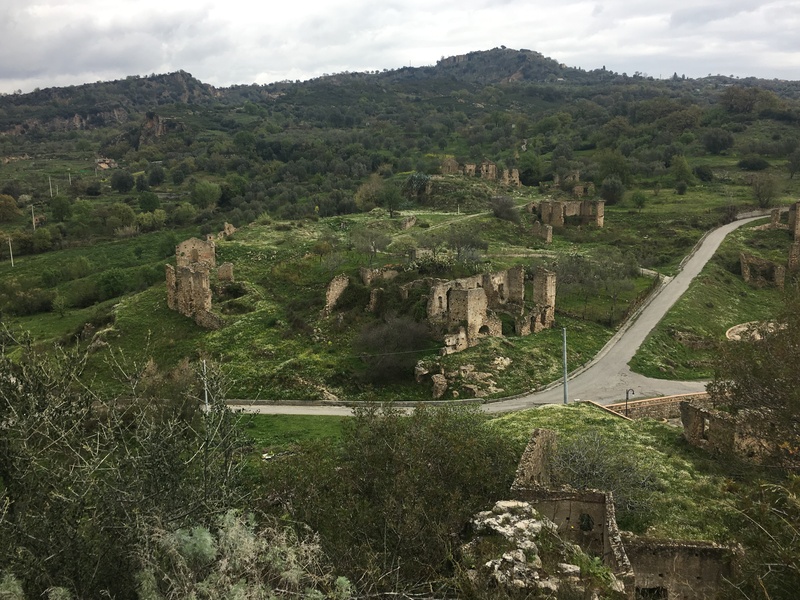 At the highest point of the village are the ruins of the castle of Bruzzano Zeffirio, built on and around one of the natural sandstone outcrops of the area. 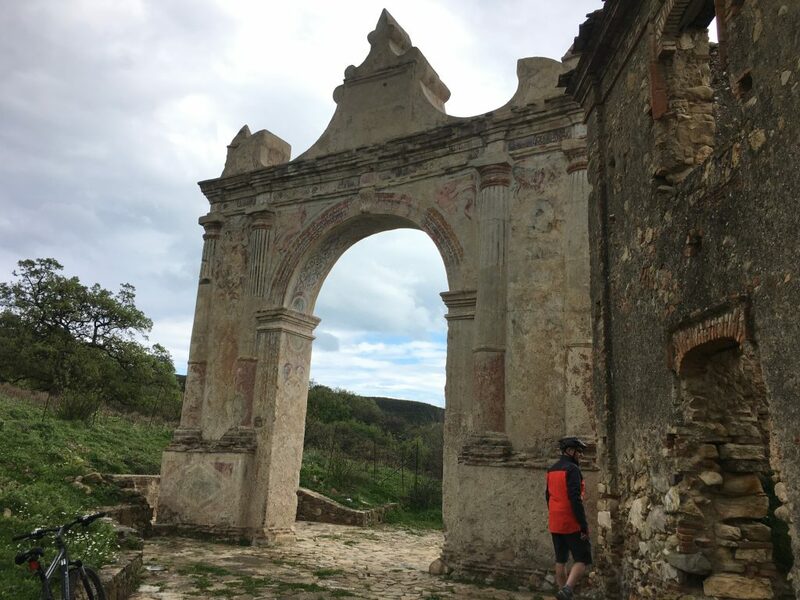 To one side there is a ‘triumphal arch’, it’s not clear what the arch commemorates but it was erected in the 17th century by the Carafa family, the local ruling family. Triumphal arch. Looking quite out of place amongst the medieval ruins. We wandered around the buildings, alone apart from the ravens croaking rebukes as we invaded their privacy. We indulged in speculation about the buildings and their purpose as no information was available. Someone has made an effort to provide parking, seating and a water fountain, but no one had gone as far as to place any placards or notices. With very little tourist infrastructure in the area it must be difficult to attract enough people to make maintenance worthwhile. 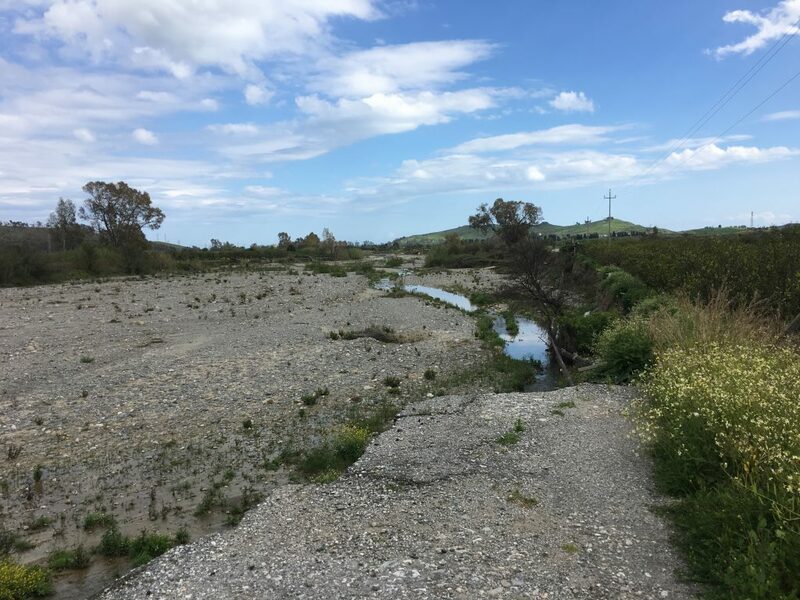 Once we’d had our fill of mysterious history and had eaten our lunch, we cycled down through the new village of Bruzzano, laid out grid style a couple of kilometres away, and finally down to the river. Yet again our proposed route, a minor road on the south side of the river, had been washed away. Instead we took the ‘main’ road on the north side of the river and followed it to the sea, only a couple of cars passed us on the way. The signs of spring were in the air, orange groves were being tidied up after the harvest, roadside verges were gaining colour, small birds were flitting between the trees and buzzards hunted above. A short but rather tedious ride along the busy main road back to Bertie finished off the ride. Only about 30k in total, but with an interesting destination and some beautiful scenery. About 2k from Bertie it was obvious that I had a puncture. I was getting slower and slower and eventually I could hear the frustrating rumble that comes from cycling without any air in the tyres. Luckily I was close enough to Bertie to push the bike rather than attempt a roadside repair on a busy road. Once back the tyres came off and an examination of the inner tubes shower I had two punctures in the rear tyre and one in the front. The ability of thorns to penetrate the rubber of my tyres is a sign I need a new pair, but that will probably wait until I get back to the UK. We stayed another two nights here, it was easy and convenient and after a little bit of an explore we found the manhole that is used for waste disposal so we knew we have sufficient services. We exchanged pleasantries with the German couple next to us who were very interested to know why we were carrying our kayak the wrong way up for aerodynamics (the roof bars are too low to carry it upside down). 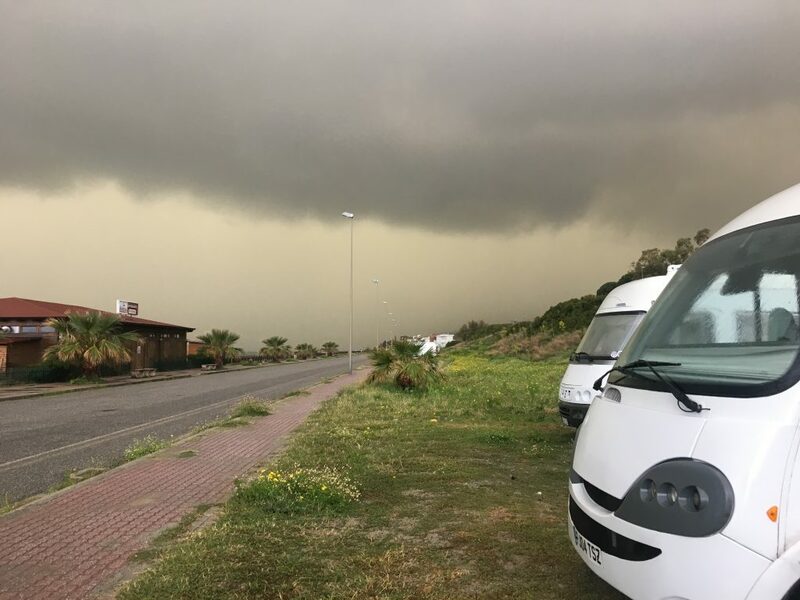 We had a longer conversation with an English couple who turned up later, they were on their way back from Sicily and in a desperate search for some good weather. No luck for them as the forecast for the next day was rain all day. We sat in Bertie and watched a thunderstorm roll in, turning the sky a murky brown before the rain and hail hit us.